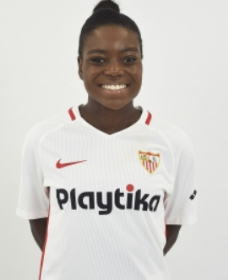 Sevilla striker Antionette Oyedupe Payne could play for the Super Falcons at this summer's FIFA Women's World Cup in France after the Nigeria Football Federation confirmed they are planning to submit an application for a change of association. The 23-year-old, who is a native of Birmingham, Alabama, has expressed her desire to represent the African champions over her country of birth. She has played competitively for United States U17s and was a member of the squad to the FIFA U-17 Women's World Cup Azerbaijan 2012. ''Coach Thomas Dennerby has followed Toni and tried to get her to come down for the Cyprus Cup, but this eventually did not come to pass,'' an official told scorenigeria.com.ng. Payne has been in impressive form for Sevilla in the Primera División Femenina, scoring five goals in 19 appearances. The former Ajax Amsterdam star, who can be deployed as a winger, has UEFA Women's Champions League experience under her belt.